Talk about your Renaissance man! 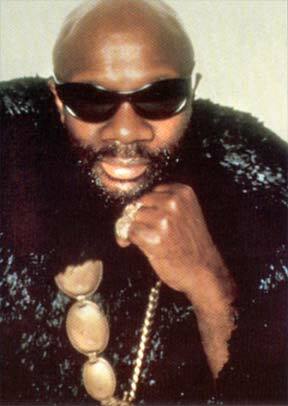 Singer Isaac Hayes, recently inducted into the Rock ‘n’ Roll Hall of Fame, also lists among his many talents those of composer, producer, film star, restaurateur and cookbook author, voice of a wildly popular animated character, radio deejay, philanthropist and even king. And yet, despite the impressive resume, Hayes remains a warm and approachable man, someone in love with life and challenge and committed to helping others experience the joys he has known. In a recent interview with The Phil, the multi-talented Hayes explained the richness he’s found in life, how he hopes to share what he’s learned and how it all began with the music. Born in Covington, Tennessee, and raised by his grandmother in Memphis, Hayes grew up in a city that echoed the musical rhythms in his family. Yet his early career goal was more in tune with the philanthropy that would eventually guide his life. As a youngster, he dreamed of becoming a doctor. Hayes had been singing regularly in church, but high school brought the opportunity to play in the school band as well. It wasn’t long before he was singing and playing with blues, gospel, jazz and doo-wop groups throughout Tennessee and neighboring states. A self-taught piano player, he eventually caught the attention of folks at the fledgling Stax record company. They signed him as a session player, and the dream of medicine was supplanted by music. Hayes’ tenure with Stax proved beneficial for both him and the company. He quickly became Stax’s most prolific composer/producer/musician. His collaboration with David Porter in the late 1960s led to numerous hit songs for such artists as Sam & Dave (“Soul Man,” “Hold On, I’m Coming”), Carla Thomas (“B-A-B-Y”), Mable John and Lou Rawls (“Your Good Thing is About to End”). Hayes took his initial steps toward stretching out his own in 1967, with the release of his first solo album, Presenting Isaac Hayes. It caused barely a ripple, and he returned to the studio. But then, in 1969, he released his second attempt, Hot Buttered Soul -- and the reaction couldn’t have been more different. His “By the Time I Get to Phoenix” crossed over to the Top 40 on both R&B and Pop charts, and “Walk on By” rose to #13 on the R&B chart. With the 1971 release of the Shaft soundtrack album, Hayes’ musical career went platinum. The soundtrack brought him an Oscar for Best Musical Score, making him the first African-American to win such an honor. “Theme from Shaft” also won a Golden Globe, two Grammys, the NAACP Image Award and the Edison Award (the highest award for music in Europe). Hayes continued to produce and release popular albums and score films throughout the 1970s. But midway through that decade his career took on an added dimension -- that of actor. Beginning as a macho, tough guy character in Truck Turner and Three Tough Guys, he eventually appeared in more challenging roles in such films as Escape From New York, It Could Happen to You, Once Upon a Time When We Were Colored and even Robin Hood, Men in Tights. The show’s creators convinced Hayes to read the script first, and when he did he found himself laughing out loud. He agreed to do the part -- and then started worrying that he was laying his career on the line. “South Park,” however, became a huge hit, sparking a movie and Chef Aid: The South Park Album -- which is making its way towards double platinum in the U.S., triple platinum in Canada and Australia and gold in the United Kingdom. “South Park has expanded my fan base from the ages of 6 to 96,” Hayes laughs. The most notable and admirable expansion, though, has been in Hayes’ view of the world and his place in it. His popularity and success, he has realized, afford him a unique opportunity to help others. Accordingly, Hayes became the international spokesman for the World Literacy Crusade in 1992 and founded the Isaac Hayes Foundation in 1999. The former is dedicated to wiping out illiteracy; the latter to providing assistance to underserved and vulnerable populations through education, health and music. Hayes’ dedication to helping others led to his being adopted as a king Ada Traditional Area of Ghana. In 1992, Hayes traveled to the African country with Dionne Warwick. Among the spots they toured was the slave dungeons, where Africans were held before being shipped to the New World. Inspired, Hayes returned to the U.S. and began lecturing African-American groups on the importance of visiting and supporting their homeland. A princess from Ghana heard one of his talks and called her father, urging him to honor Hayes with a kingship. Officially known in Ghana as Nene Katey Ocansey I, Hayes takes his duties as a king seriously, working hard to better the lives of those who live in his principality. He was given land to build a palace but decided to build a school instead and hopes to encourage industry and economic health. In the meantime, Hayes has -- of course -- several other projects underway. He’s just opened two restaurants (in Chicago and Memphis) and has his Cooking with Heart and Soul on the shelves. He is touring with his music and working on more recordings. He wants to get back into doing more movies and writing more songs. In short, he wants to continue to expand the full life he has been living. “I can’t help but do it,” he laughs and says. Spoken like a true Renaissance man and a king among fellows. Long may he reign.